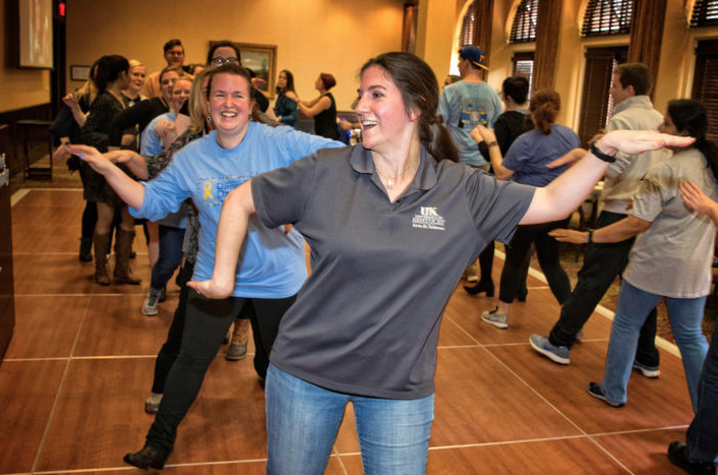 LEXINGTON, Ky. (Jan. 28, 2018) – In preparation for DanceBlue 2019, the University of Kentucky is hosting the fourth annual Staff and Faculty DanceBlue Dance Party from 11 a.m. to 1 p.m. Friday, Feb. 8, at the Hilary J. Boone Center. In addition to the Boone Center, a satellite dance party will be held at the E.S. Good Barn. Each year, smaller events held throughout campus help to support the 24-hour dance marathon in the spring. Throughout the years, millions of dollars have been raised "For the Kids" to benefit the DanceBlue Kentucky Children’s Hospital Hematology/Oncology Clinic and cancer research. "DanceBlue is an amazing student-run effort that has shown incredible support for Kentucky kids battling cancer," said William Andrews, Staff and Faculty DanceBlue Dance Party chair. "I feel it is critical for faculty and staff to recognize and support the amazing work DanceBlue has begun and hopefully inspire and assist the effort to grow the program." The event will feature a presentation by the DanceBlue leadership team, as well as line dances, patient stories, games, "Best Spirit" prize awarded to the team that raises the most money, lunch and a final reveal of the total amount of money raised by the UK family. Join as a dancer or an observer at the event. Click hereto register as an individual or team. $20 entry fee for each participant and observer, lunch will be included in the $20 participant fee. Funds can be donated through the event website or brought on the day of the event. Donate to the DanceBlue-Golden Matrix Fund. Can’t make it to the event? Click here to support the DanceBlue-Golden Matrix Fund. For questions, please view the event FAQ page or contact Denee Wilson: denee.wilson@uky.edu or 859-257-9242. For more information about DanceBlue, please visit danceblue.org. Connect with DanceBlue on Facebook at facebook.com/danceblue and on Twitter at twitter.com/UKDanceBlue. DanceBlue is a program housed in the UK Center for Community Outreach. The CCO seeks to serve, connect and unite the University of Kentucky with the surrounding community in collaborative efforts to promote lifelong community service.